Today we had visits from a couple of technicians to put right the various problems with the equipment. A female rehabilitation doctor also arrived with a massive entourage. They crowded in the doorway, too many to count, and since Clive always moves like an orang-utan from hand-hold to hand-hold under his own steam, he could see little point in their presence and asked that they wait outside. Which they did, chatting and smoking, thick on the ground as the buds in the photo. Only one gorilla-like male came in, once, to move our own pole which Clive needed to raise himself from the sofa – where he’d taken refuge late last night after the bed finally gave up the ghost. Passing by a rose bush, I noticed that some of the buds had white fly on them. A squirt in time saves nine, I thought, so I fetched the insecticide. 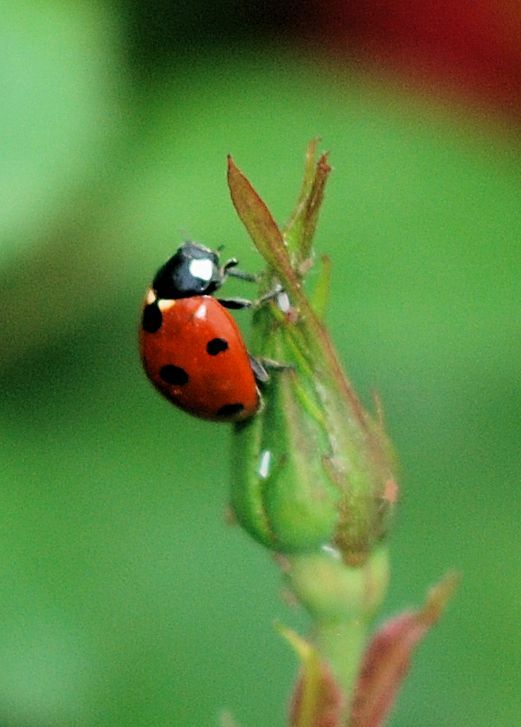 As I stood there with the canister poised, a ladybird caught my eye on one of the buds. As far as I could see, it was eating the white fly. In other words, doing the job for me. It was mighty slow about it, though. 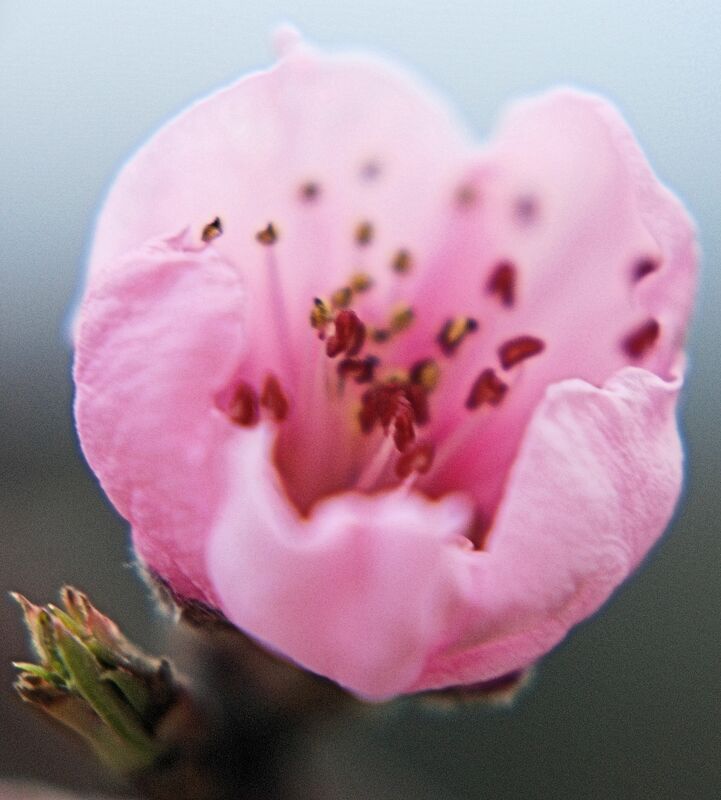 As dusk fell it was still on the same bud; in fact still on the same side of the same bud. Well, they say eating slowly is good for you – I hope it enjoyed its meal! 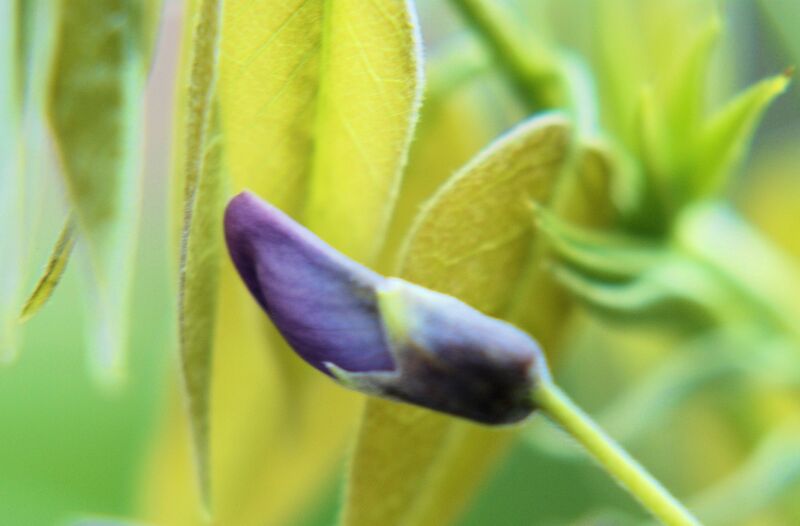 The photo shows a single pea-type flower bud which is just opening at the top of a wisteria tress. Wisteria tresses can be quite magnificent – more than the sum of their parts, you might say. But I’m very fond of the part; in fact, I think I prefer it to the sum! Will we ever get a grapefruit? Last year our little pip-grown grapefruit tree suddenly grew a dramatic vertical spike. I believe it might be what you call a water shoot. Well, after much reluctance and procrastination, I finally did the terrible deed and cut it off level with the rest of the tree in the hope that it would bush out and stop looking like a giraffe. 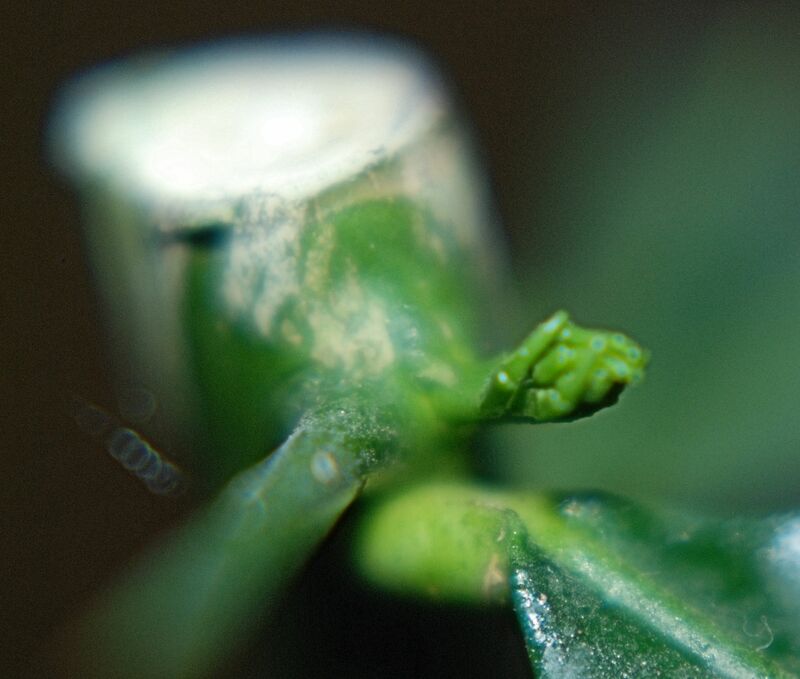 Maybe, just maybe, I’ve been vindicated because tiny buds have appeared in the axils of the leaves at the top of the remaining spike. The photo shows the topmost one. 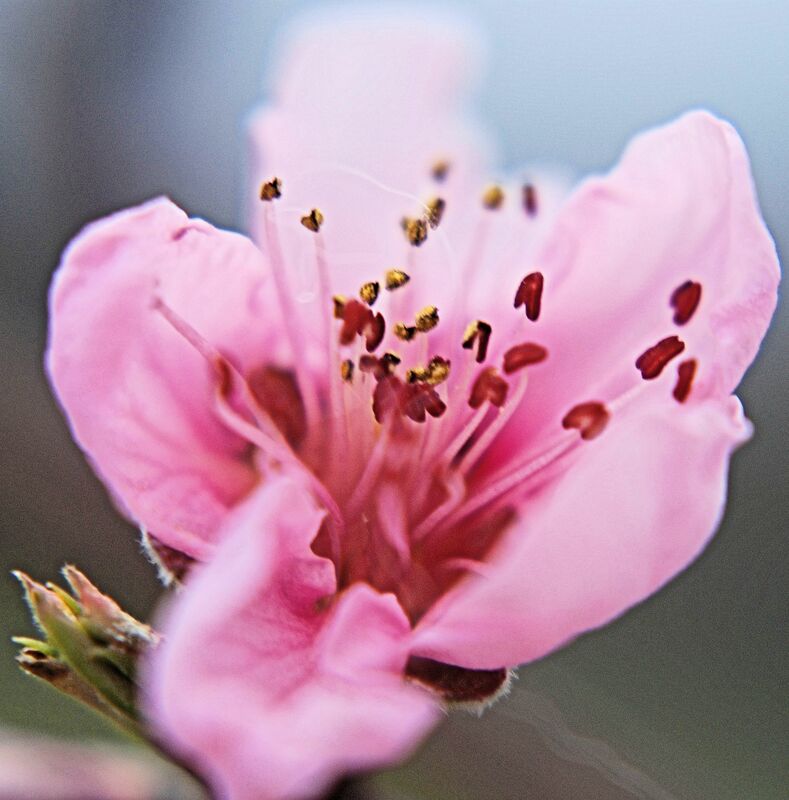 A fortnight ago the first pink appeared on the nectarine buds. I’ve been watching ever since as the pink part got bigger and bigger but stayed resolutely closed. Then suddenly this evening the first flower opened. In fact it opened as I watched it. 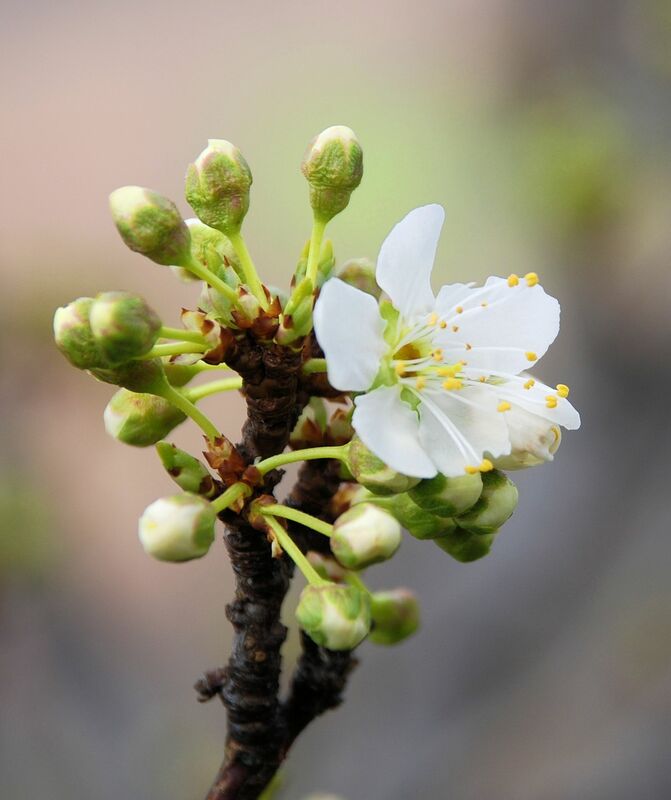 I know because I took a photo, then decided to take another, and already the bloom was almost unrecognisable! 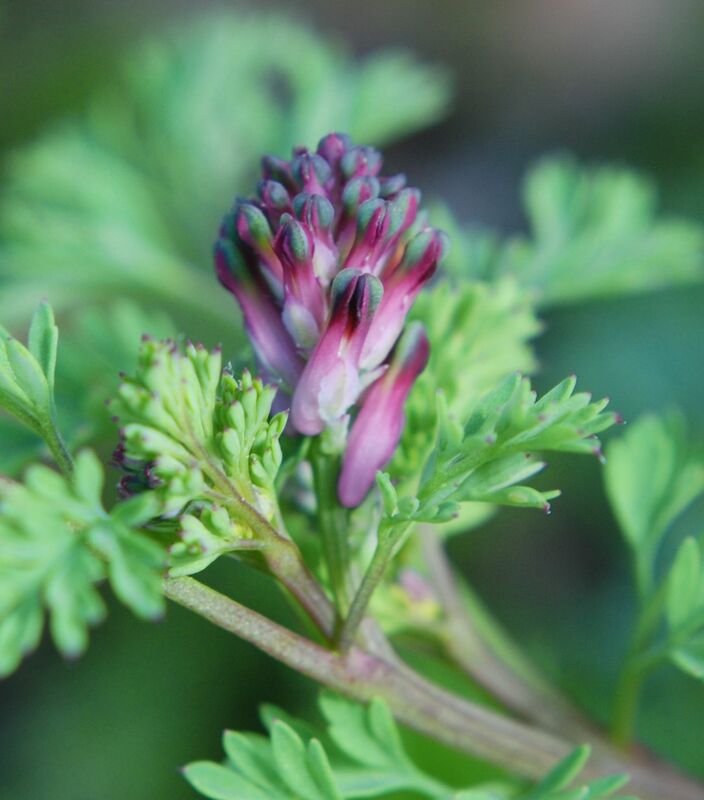 This photo is only of a fumitory bud. I say ‘only’ because it’s basically a weed. It was growing around the rose I was pruning today and I tried to trample it as little as possible. After I’d photographed it with my diopter lens + 4, I realised just how delicately beautiful it is. It’s the small and humble things that give the best return on observation, it seems to me. 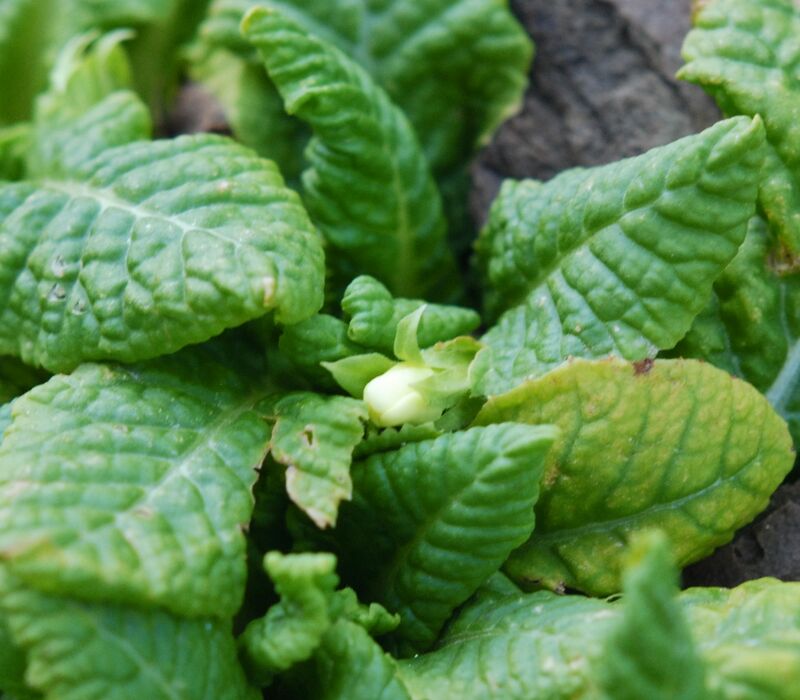 I found the first pale yellow primrose buds under the big oak by the house today. They’re not the only yellow, though. There have been golden yellow crocuses for some time. 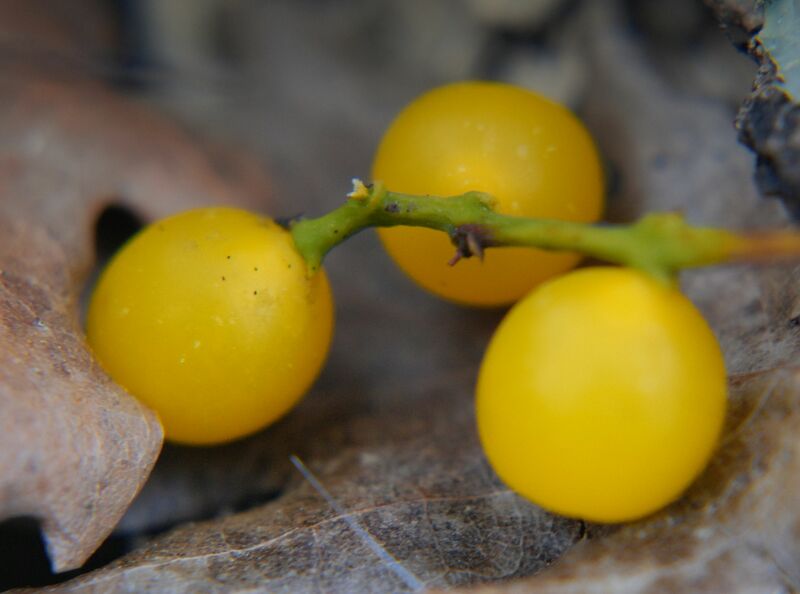 But the flowerbed is dotted all over with yet another yellow: berries which have fallen from the yellow mistletoe growing in great clumps on the branches of the oak.